The Pound faced another volatile day as uncertainty around the Brexit deadline prevails. 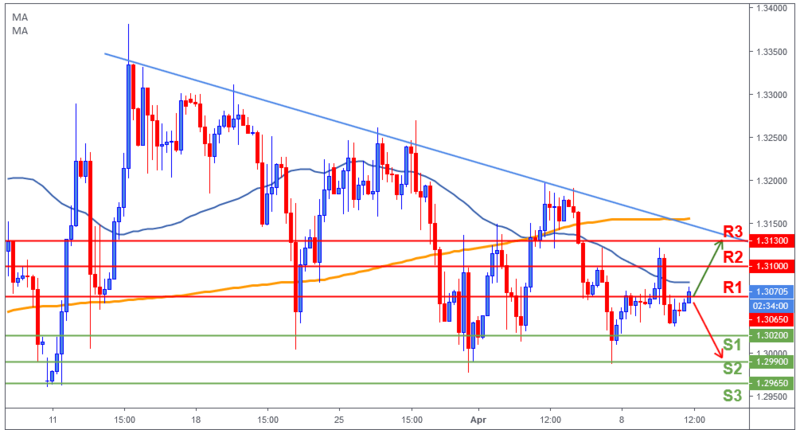 No final results of the cross-party Brexit talks challenged the Sterling traders’ optimism on Tuesday while speculations that France, Germany, and Italy will be hard on the UK request added further weakness into the GBP/USD pair. However, a news report that both the houses of the UK parliaments approved PM May to request Brexit deadline extension to June 30 and Reuters report that the EU is ready to offer flexible Brexit extension till March 2020 helped the Pound recover recent losses. Looking forward today, traders will have a few key events to keep an eye on, first being the UK GDP data and second the US CPI numbers and third the FOMC meeting. But as of late, any new Brexit development will be the main sentiment driver for market participants. The Pound bulls attempted to break above 1.31 (R2) yesterday but they were rejected hard taking price back towards 1.3020s, just above our support level. The sentiment is still mixed, as neither the bulls or the bears are in control so far. A successful break above 1.3065 (R1) will take price to retest 1.31 (R2). However, if 1.3020 (S1) is lost, the bears will try to weaken the Pound towards 1.2990 (S2) or even further to 1.2965 (S3).